We spend a couple of weeks each low season – June-August – driving around checking out and investigating places, venues, activities that are or may be incorporated in an A4U tour package. This year we did 5200 km. (approx. 3200 miles) in 15 days, stayed over-night at 11 different hotels and guesthouses and visited a number of others. Even having made this trip several times before, each year brings something new. Out­standing this year was the drive through three different mountain passes: Prince Alfred, Montagu and Swartberg, the one more spectacular than the other. These are all in the south western part of the country. 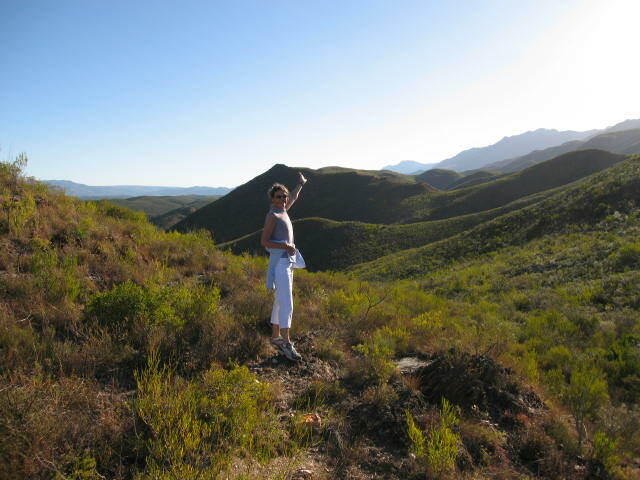 Further north, in the Rooiberg (red mountains) you may hike or ride horses in beautiful surroundings. Several South African villages have become tourist destinations in their own right. Arniston, Elim, Pringle Bay, Montagu, Prince Albert … mentioned casually and in no order of priority. There are so many others, well known and still relatively unknown (the so called “best kept secrets”). Almost everywhere we noticed a similar trend: More and more of the already established, excellent guest houses and lodges are now offering – in addition to relaxation in peace­ful surroundings, good food and various activities – an in-house Spa with massage and beauty treatments. In short: A great variety of places and activities on offer. We could have spent twice the time and done twice the distance and still not covered half of them. To those of you who contact A4U with a request for the typical two week trip: The Cape/Wine Dis­trict/ Garden Route, plus safari: It is a good start, you will have a nice sample of South Africa, but the country is large, and so much more is being offered, not only here but also in neigh­bouring countries. Earlier this year we visited Pemba, in northern Mosambique, and the adjacent archipelago. Definitely worth the trip! Contact us and we will tell you more.